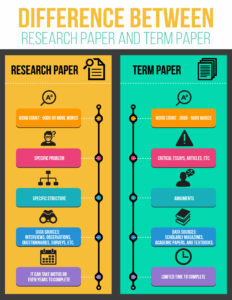 Term paper and Research paper are two different things. The two share similar features and they may even be related, but exhibit differences to consider. The research paper is an academic style of writing that requires the student to answer a significant, methodical, and theoretical level of questioning. Similarly, term paper requires the student to interpret what he or she gathered from the subject matter to display a clear understanding in the form of a paper. It can be of various lengths, which can be up to five thousand words. A research paper is devoted to a problem within a specific course. Research papers are written to study some specific problems which have not been covered efficaciously or sometimes when results are doubtful. Research paper usually has elements of research. 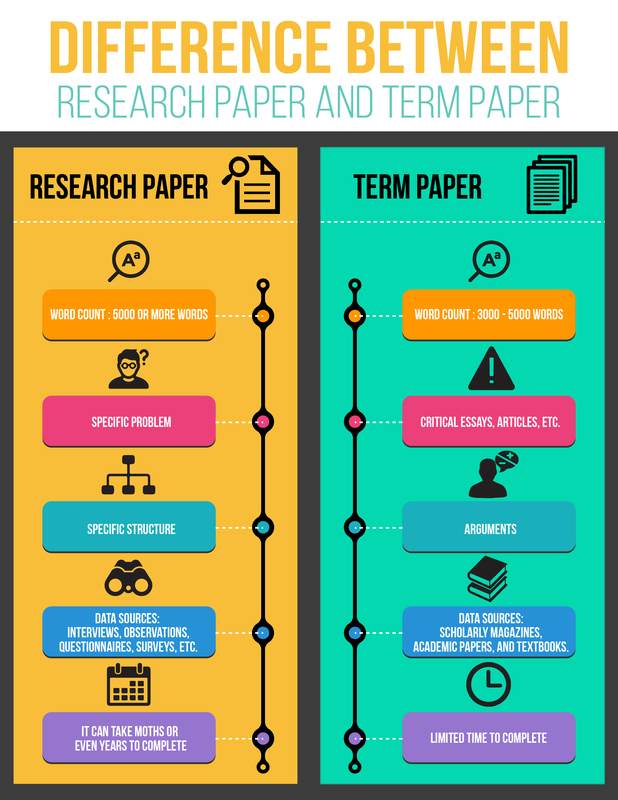 A research paper has a specific structure despite the subject; the title page, the table of contents, the introduction/background information, the literature review, the methodology, the results, the discussion, and the conclusions/recommendations. Each of these sections has specific guidelines for writing. No matter the problem question under research, the structure usually remains the same. This type of paper writing usually requires time for conducting research and writing it. There are many types of research which differ in properties according to the mode of information gathering technique, examples; interview, observation, questionnaire, survey, and experiment. Depending on the hypothesis and the purpose of the study, the research may take time ranging from a day to years depending on the volume and difficulty of problem question. A research paper is usually a lengthy piece of writing. Usually, research papers are a minimum of ten pages and may be up to hundred pages and more. One can rarely meet a research paper less than ten pages; it is almost impossible in its case to explain the major points, discuss results and prove the hypothesis in a low number of pages. A research paper can cover materials studied over previous years which are laid out in various courses in forms of books, journals, previous research papers, and published articles. Writing a research paper on a particular problem may require turning to the particular problem discussed in the past. The materials learned from the past may help in explaining some processes, discussing the background information, and analyzing the literature on the problem question. A term paper, on the other hand, is aimed at checking students’ knowledge after some themes studied. Having completed a specific theme, students may also be asked write an essay, take a test, or complete some task devoted to this particular theme study. Students are required to write term papers to demonstrate that they have gained the required knowledge and skills in a certain subject matter. A term paper is usually assigned to students near the end of a class as a tool to count toward the subject’s final grade; in fact, in some instances, it will be the only assigned means to grade. Although the length may vary greatly, it is common for them to be from three to five thousand words. Generally speaking, one writes a term paper to indicate that he or she has learned or acquired the knowledge of a particular subject. The term paper is usually given at the end of the term and counts as an important percentage of the final exam. A term paper generally runs between 3,000 and 5,000 words. A term paper permits for a vital examination of current topics and usually allows the writer’s opinion. Term paper contains arguments and persuasions that must be supported with facts taken from various reliable sources, such as scholarly magazines, academic papers, and textbooks. A term paper, being part of a course, is usually completed after a specific period of studying. The course is usually divided into terms and themes. Having come to an end of a term, students are usually asked to take a test or complete another task, which will show how well students have learned the course material during the discussed period. The grades for this task usually have a special value in the overall student’s grade. A term paper can be of any nature and structure. Opposing to a research paper with a specific structure. A term paper may be written in the form of an essay or other forms of writing; it can have a questions-answers structure; it can be an article, a review, an annotated bibliography, a test, and even a research paper. A term paper can be of any length. It can be one-paged, unlike the typical research paper which cannot be adequately expressed on a page and could also be twenty paged, no matter what the topic is and what type of the task is requested. Overall, each professor should select what kind of task fit better the specific topic which has been studied. Usually, a term paper covers the theme or the themes studied during a particular period, the main purpose of such task is to show how well students have understood the materials and lessons taught during that period. 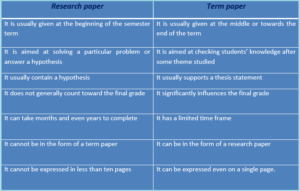 A task in a term paper can be in the form of a research paper, while it is impossible to have a task in a research paper to write a term paper. These two types of writing are different even though each student’s task is aimed at checking their knowledge. Educational process can be complicated and usually require constant motivation and encouragement from the professors. 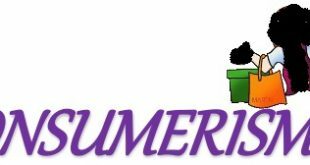 Therefore it is advised that tutors should try not to impose his/her opinion on students when writing term papers, this helps term paper serve its purpose better, which is to determine students’ knowledge on the topic. Some students may need the appreciation of their skills or some additional punishment, which may stimulate them to work harder. This kind of academic writing involves exploration of the topic idea which aims to answer a particular theoretical question. A typical document consists of 5,000 words but is often a bit longer. The student is asked to interpret information provided on a chosen topic and analyze it thoroughly. It can be assigned anytime, yet most instructors give this task at the beginning of the semester to allow students to have enough time to gather data and compose their works. This kind of paper often involves primary data collection and its further interpretation. A student writes this paper to demonstrate his or her knowledge of a particular subject studied. The length of the work usually varies from 3,000 to 5,000 words. A chosen topic should be carefully examined, and the writer should provide his or her personal opinion towards the issue under study. This assignment is usually given at the end of the semester and significantly influences the final grade. The term paper should be based on credible sources, such as scholarly articles, academic works, lab reports, and textbooks. Despite both assignments share some qualities. In each instance, students can pick a topic that arouses their interest. They use the same type of resources and the structures of the documents could be quite similar. The real difference between these pieces of academic writing, is that a research paper is assigned at any time and doesn’t generally count toward the final grade. Another aspect that writing instructors pay their attention to is the fact that a research paper often contains a hypothesis while a term paper supports a thesis statement. Besides, the research paper usually has a long list of references. The term paper assignment, however, is shorter and does not usually contain appendixes. 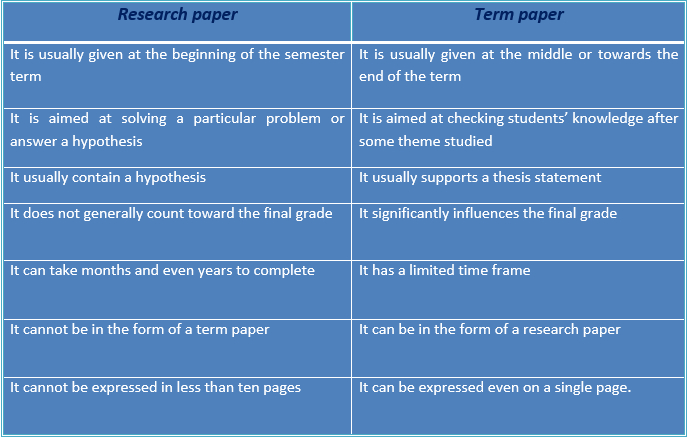 Another significant difference between a research paper and a term paper is that the research paper is used to make the student engage in problem-solving activities while term paper is simply meant to test the student’s knowledge, not necessarily solve the problem.